Colorectal cancer is the third-leading cause of cancer deaths in the U.S. It's also is among the most preventable...with early detection. 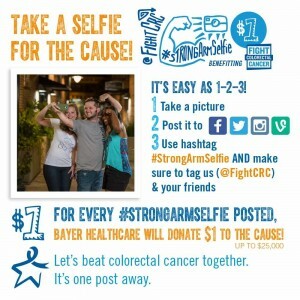 That’s why Mayo Clinic is joining Fight Colorectal Cancer in their #StrongArmSelfie campaign. We’re officially launching the campaign in March, but until then, we’re asking social-savvy friends (that's YOU!) to start now by flexing your muscles in photos (or short videos) on Facebook, Twitter, Instagram and Vine. The image at right (click to enlarge) explains how to participate, but you can also download this flyer for more details. We’ll also be producing a music video for a new song that Nashville artist Craig Campbell wrote and recorded especially for the campaign. When he was 11, Craig lost his father to colon cancer, so he’s a big supporter of the fight. You'll love his anthem! Be super-creative with your #StrongArmSelfie, and your submission just might get chosen for either the full music video or the shorter one looping on the NASDAQ JumboTron in Times Square in March. Bayer Healthcare is donating $1 to Fight Colorectal Cancer for every #StrongArmSelfie posted, up to $25,000. But even more importantly, posting your selfie and tagging your friends gives you an opportunity to start a potentially lifesaving conversation about getting screened. Please join us in the campaign with your #StrongArmSelfie post today! Colorectal cancer is the third-leading cause of cancer deaths in the U.S. It's also is among the most preventable...with early detection.